The program falls under the guidance of the Commerce Department’s National Institute of Standards and Technology (NIST). At Glidewell Dental Labor-atories, a UR5 robot enables dynamic handling of dental crowns milled in CNC machines. Watch how this application saves 9 hours of production time and two milling operators per shift. And find out how vision guidance eliminates operation breakdowns when dispensers of blank crowns are jammed or empty. > Who is the 2014 Steel Man of the Year? 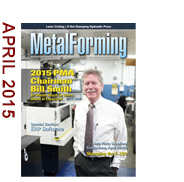 Fabricated-metals production should post moderate gains of 3 percent in 2015 and 4 percent in 2016. In the three months ending January 2015, most types of fabricated metal products saw production increases relative to 1 year ago. Stamping was up 11 percent, architectural and structural metals rose 5 percent, machine-shop-turned products and fasteners grew 2 percent. Imports of fabricated-metal-products increased 6 percent, exports increased 8 percent. Other sectors addressed by the report include motor vehicles and parts, household appliances, metalworking machinery, and medical equipment and supplies. Advances in material forming and joining are expected to yield a competitive advantage for U.S. manufacturers in many market sectors, which will lead to more jobs and a stronger economy. Road-mapping the technology-development priorities and developing solutions to the challenges ahead is critical to realizing these benefits. A key step in developing a roadmap toward ensuring U.S. competitiveness in material forming and joining is the NIST Advanced Manufacturing Technology Consortia (AMTech) program. MetalForming magazine and the Precision Metalforming Association are proud participants in the program, and ask your help. Please take 2 min. to complete an online survey gauging the projected technology needs of the metalforming industry. Individual survey responses are anonymous in the final report. As an incentive for completing the survey, all respondents will receive a summary report of the survey findings. Engineered for lean manufacturing principles and designed for more efficient and productive fabrication, Versatility Tool Storage Cabinets and Carts protect and organize your Press Brake and Turret Press Tooling and save valuable time. Join more than 150 peer executives for a two-day educational and networking conference. Celebrating its 22nd year, this program delivers attendees the most timely automotive forecast information, legal and regulatory updates that can impact their current and future business, and insights on customer requirements. The 2015 program will feature general sessions on the global industry outlook, fostering innovation and positioning your company for long-term profitability. Whether hot stamping, warm forming, deep drawing or general stamping, Experi-Metal's new press cell can do it all. Welding Mfg. Engineer (IN)/ General Sheet Metal Works, Inc.
Production Engineer/Tooling Engineer (IN) / North Vernon Industry Corp.
See also: Die Cad Group, Inc., CS Unitec, Inc., Industrial Magnetics, Inc., Versatility Tool Works & Mfg.